Main: Oriental Duck on a bed of wok vegetables with ginger and soya sauce, finished with black and white sesame seeds. Dessert: Chocolate Fondant with Vanilla Ice Cream and Salted Caramel Sauce. Starter: Char-grilled scallops with a Provencal sauce and sweet and sour spring onions. 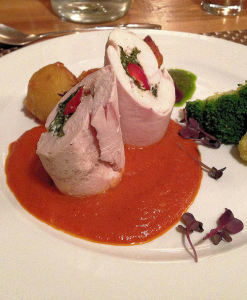 Main: Chicken stuffed with Roasted Pepper, Goats Cheese and Kale, served with a tomato sauce, broccoli and Roasted Potatoes. Dessert: Traditional homemade Raspberry and Apple Crumble with creme anglais. 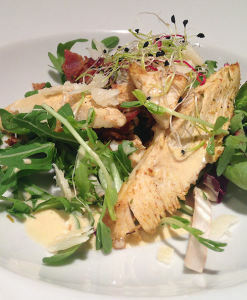 Starter: Homemade Rabbit and Apricot Terrine served with side salad and dressing. 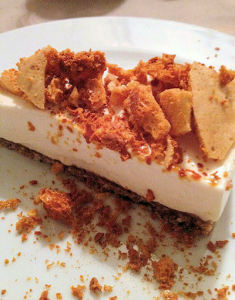 Dessert: Greek yoghurt Cheesecake with crunchy Honeycomb pieces.